Create a casual modern look in your living room with this high quality upholstered sectional sofa. 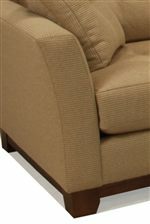 This sectional is made in the USA, using construction techniques that ensure this piece will really last. Contemporary flared arms, plentiful seating, and modern tufted cushions make this sectional a great choice for your living room or family room. A sleek wooden base rail and tapered block feet complete this sophisticated yet comfortable style. The 1260 Contemporary Sectional Sofa with Flared Arms and Tufted Cushions by McCreary Modern at AHFA in the area. Product availability may vary. Contact us for the most current availability on this product. 1260-CL LAF Chaise 1 39" 67" 33"
1260-LO Armless Loveseat 1 63" 41" 33"
1260-DR RAF Daybed 1 39" 90" 33"